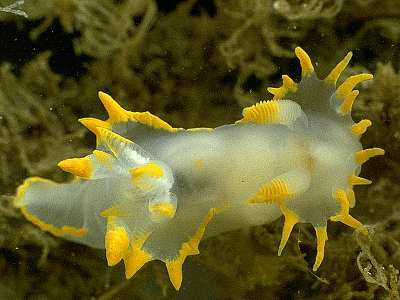 Description: This nudibranch may grow to a length of 45mm, the ground colour is translucent white. Eight or more yellow tipped oral veil processes are present. There is a yellow tipped process at either side of the gills, which in larger individuals usually becomes flattened and develops several points. The tips of the rhinophores, propodial tentacles, oral lobes and gills are also pigmented with yellow. Occasionally rounded yellow spots are present on the body. Habitat: It appears that P. faeroensis feeds on erect bryozoans such as Bicellariella ciliata, Crisia and perhaps Bugula species. The spawn is a white coiled ribbon. Distribution: A common species in the circalittoral and on steep rockfaces on the western and southern coasts of the British Isles. Originally described from the Faeroes. Similar Species: Compare with Polycera quadrilineata. Eight or more processes on the oral veil, two rhinophores without basal processes. White with yellow processes and usually without yellow spots on the body. Picton, B.E. & Morrow, C.C. (2016). Polycera faeroensis Lemche, 1929. [In] Encyclopedia of Marine Life of Britain and Ireland.